I have been trying to post this for quite awhile, weeks really. I thought the timing today was good as alot of people have leftover ham after Easter and this is a great easy way to use it up. Don’t throw out that ham bone! We had a ham bone in the freezer from Christmas (that a friend had leftover and was going to throw out, so I took it home to freeze). I decided I would try to make a slow cooker white bean soup to use it up before it was too old and ended up in the garbage. I am not good with freezer cooking and I often put things in the freezer with the best of intentions, but then never use them and they end up freezer burnt. A couple of notes, you will need to soak the beans overnight and our ham bone as frozen so we thawed that in the fridge overnight as well. We placed the thawed ham bone in the slow cooker. Put in the white beans (which had been soaked overnight). 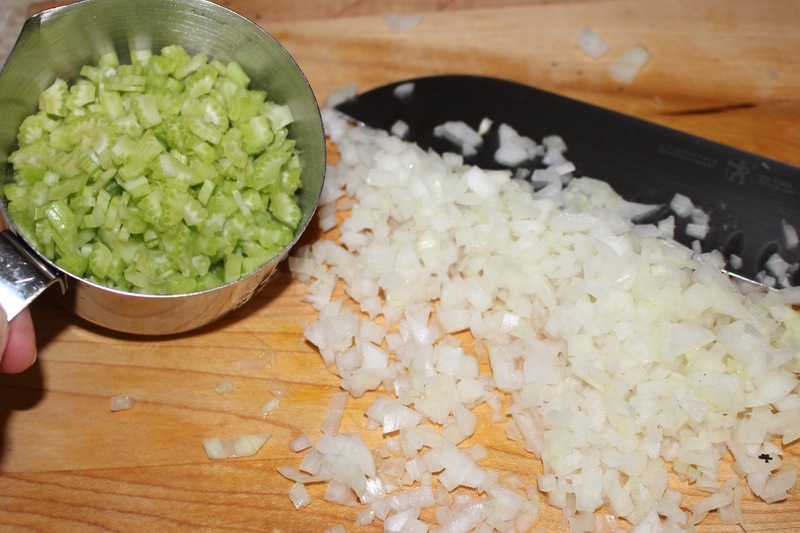 FYI-the garlic was minced. Threw everything else in on top of that, poured in the water and cooked for about 6-7 hours on high (you could do 8- hours on low). At the end of the cooking time, carefully lift out the bone and cut off some bits of meat to add back to the pot. We don’t like ham very much so I didn’t add much back to the pot, but add back as much as you would like to suit your taste. 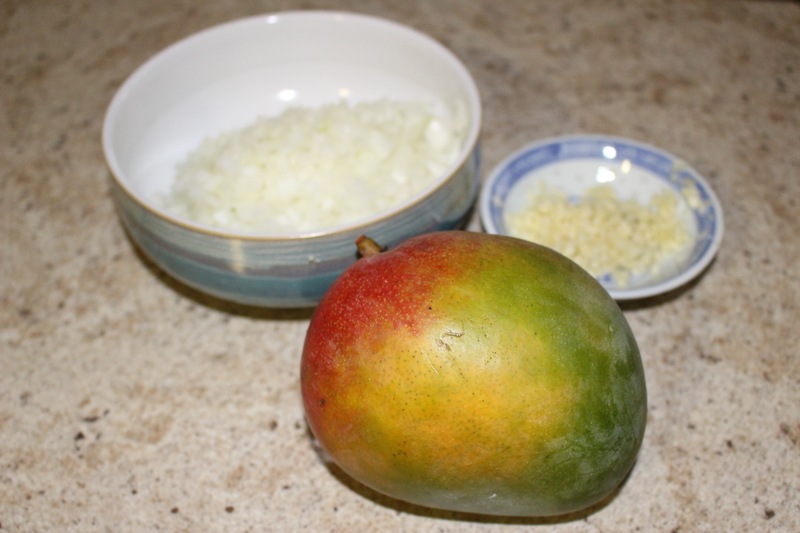 Try it for flavour at this point and add a little more salt if needed. This side dish to delicious. Even if you don’t like kale just try it once I guarantee you will like it here. I know at least two people that do not like kale, don’t eat kale, but love this. I didn’t get a picture of it plated because I took this to a friends house for dinner. This is not a low cal recipe. It is a hearty stick to your ribs winter dish. We only make it about twice in a year for a treat, though it is so good I could eat it every week. Boil potatoes in slightly salted water until soft and then drain. once drained well, mash. While the potatoes are cooking boil another large pot of water and cook the kale for about 5 minutes. It doesn’t get fully cooked at this stage as it will get finished in the oven later. 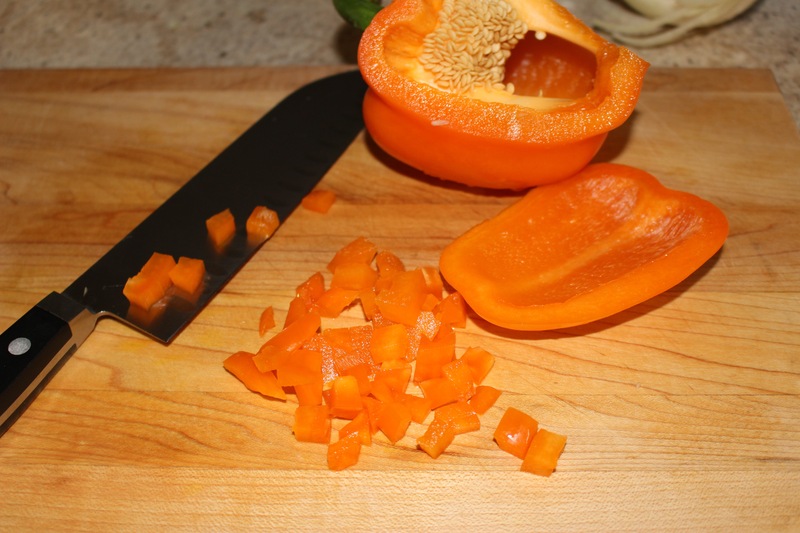 One it is cool enough to handle chop it finely, just run the knife through it several times, it doesn’t have to be pretty. 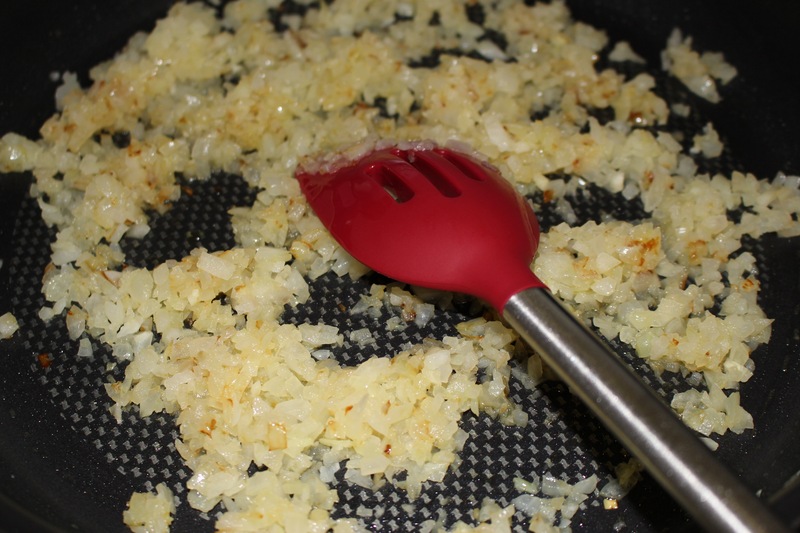 In another small pot melt butter and cook onions with a sprinkle of salt until they are very soft and translucent. 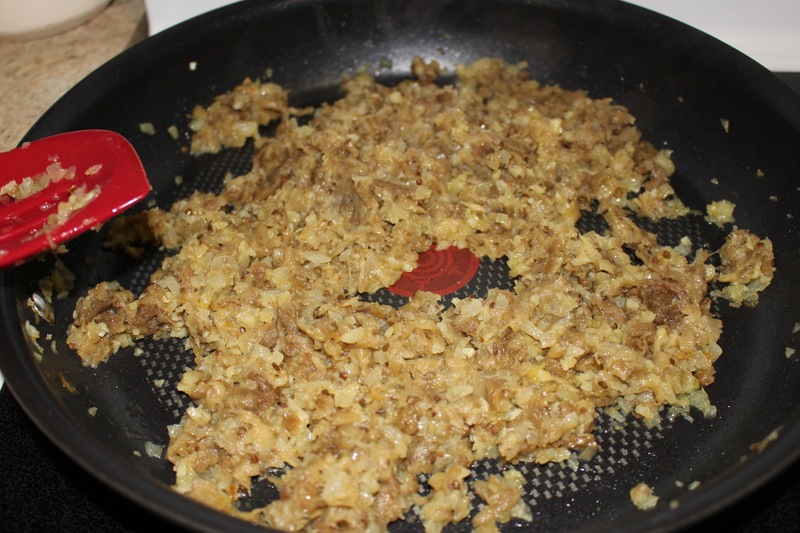 Mix cooked onion mixture into the mashed potato. Add cooked chopped kale, cream and milk (be slow with adding the milk & cream so you don’t make it to runny. It should be very creamy but not watery. I add 1/2 of cup of each at first and add more as required to get the consistency as I want it. 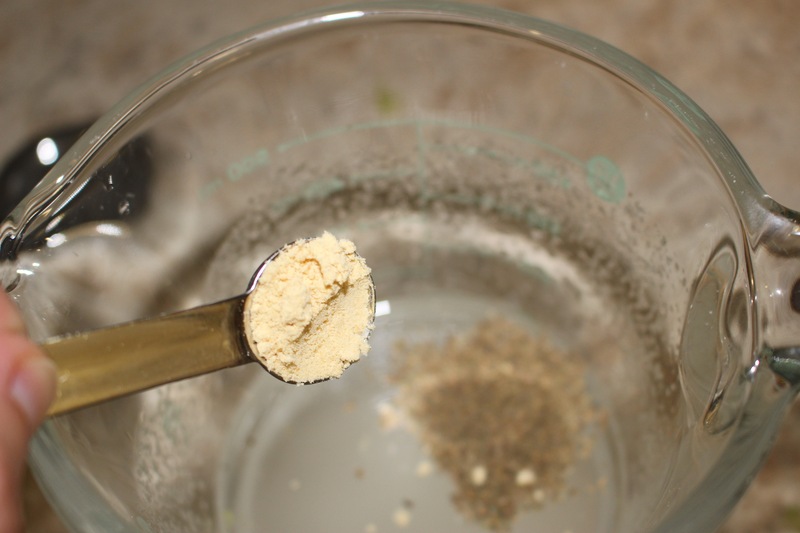 How much you add will depend on the potatoes you use and the moisture content. Mash all together, add salt to taste. 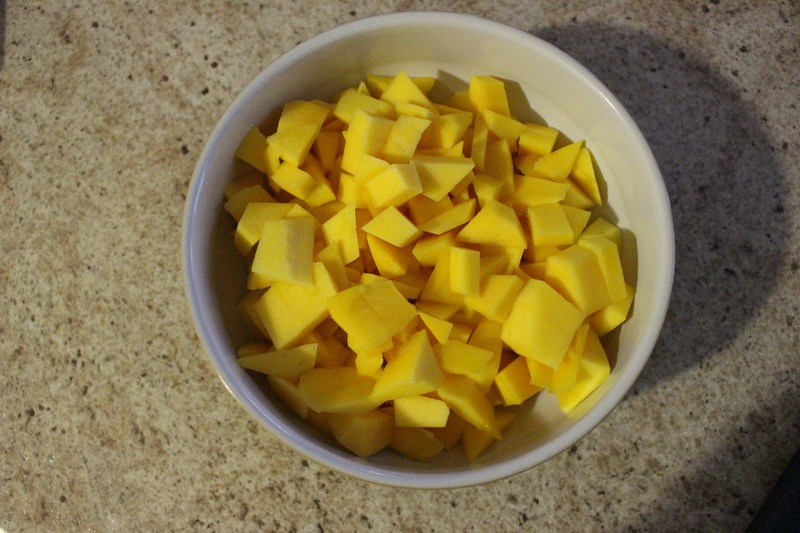 I usually toss in 1/4-1/2 cup of grated cheese and mix it through as well, for extra cheesy flavour. Place mashed mixture in baking dish or casserole dish and sprinkle top with grated cheese and bake at 350F until cheese is melted and top is lightly browned, about 20-30 minutes. Cheesy warm creamy mashed potato flecked with little bits of green. Delicious! Adapted from: The Green Door Restaurant Vegetarian Cookbook. It is warm again today, it had been cool all last week and I was fearing that our short summer was over. The sun is out today and it is warmer, thank goodness for that. 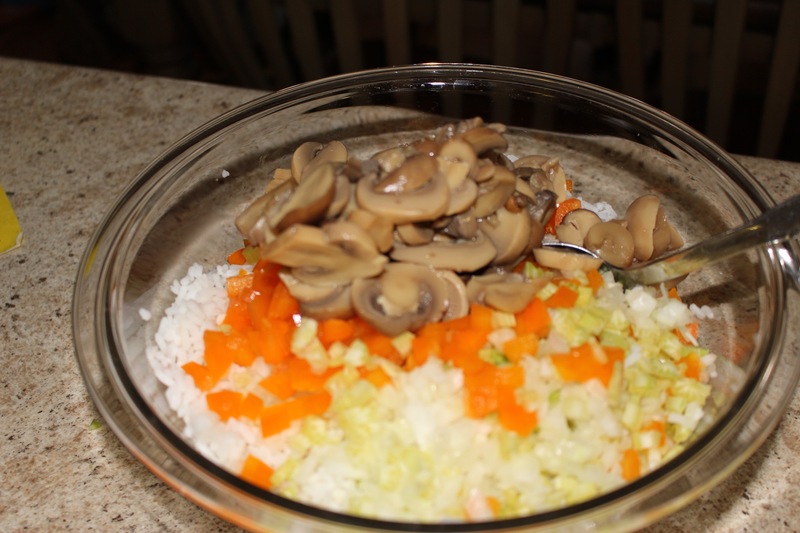 A friend came over for dinner last night and I made this rice salad to go with BBQ. I am glad I did because when she saw it she was very happy and said “oh you made that salad again, I love it”. Well that worked out well and I sent her home with the leftovers. 2 cups of minute rice & 2 cups of water. Cook the minute rice according to the package directions. 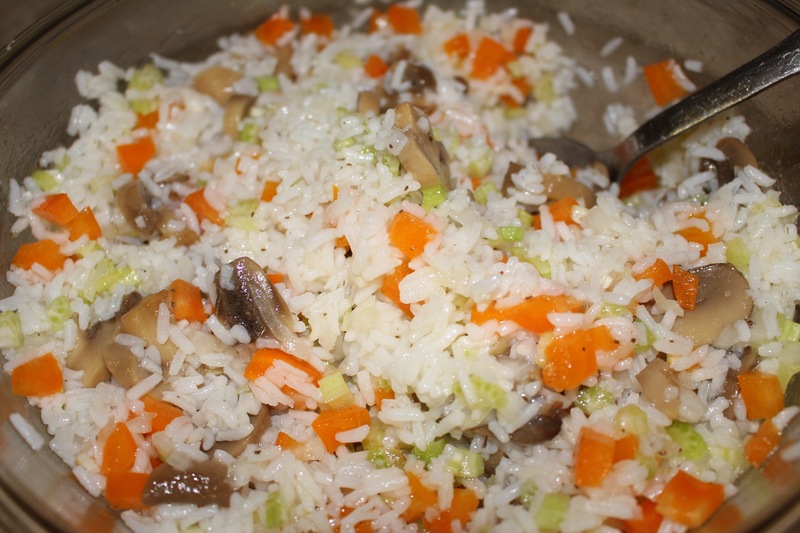 If you don’t want to use minute rice you can use any rice. I think you will need 3-4 cups of cooked rice. Once the rice is done let it cool. 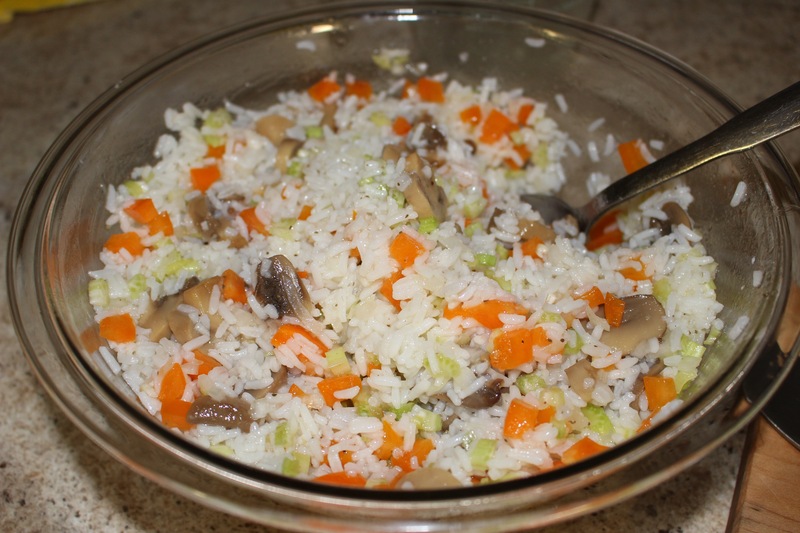 Our the dressing over the rice mixture and stir well to coat. Refrigerate until ready to eat. 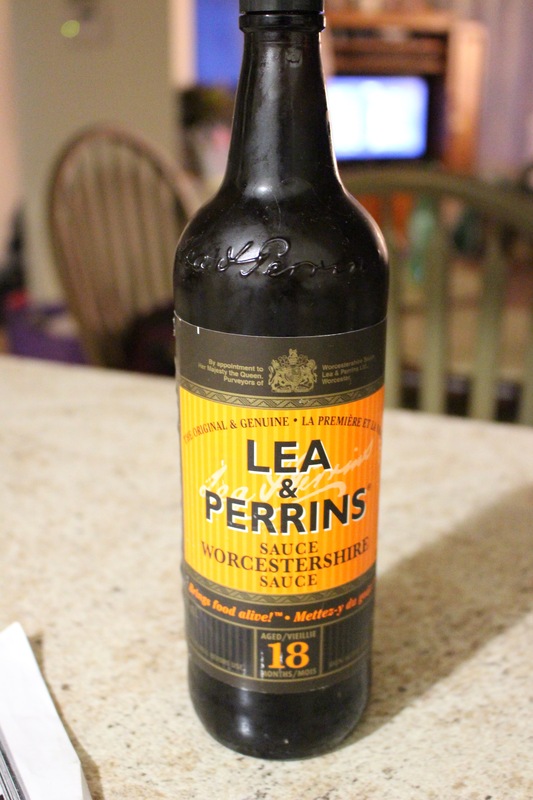 This keeps well for a week in the fridge. 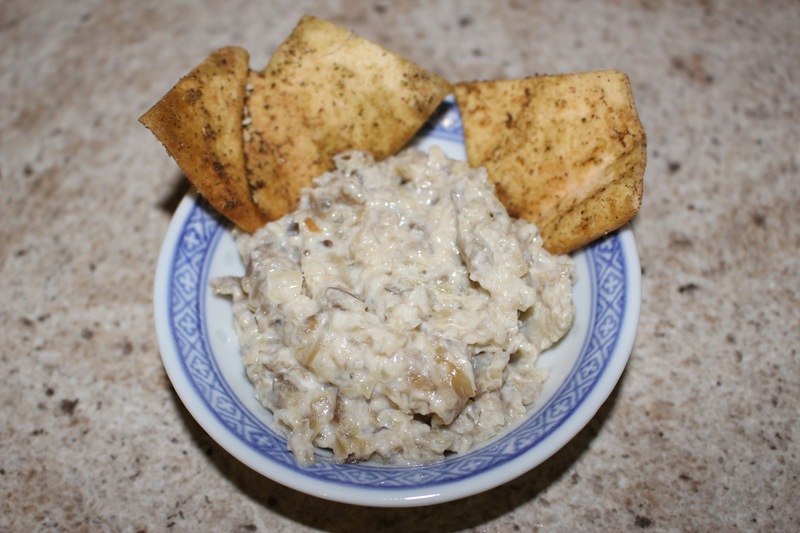 I guess you could call this baba ganoush ( i know that is probably not spelled right), no matter what you cal it or how you spell it, it is GOOD! 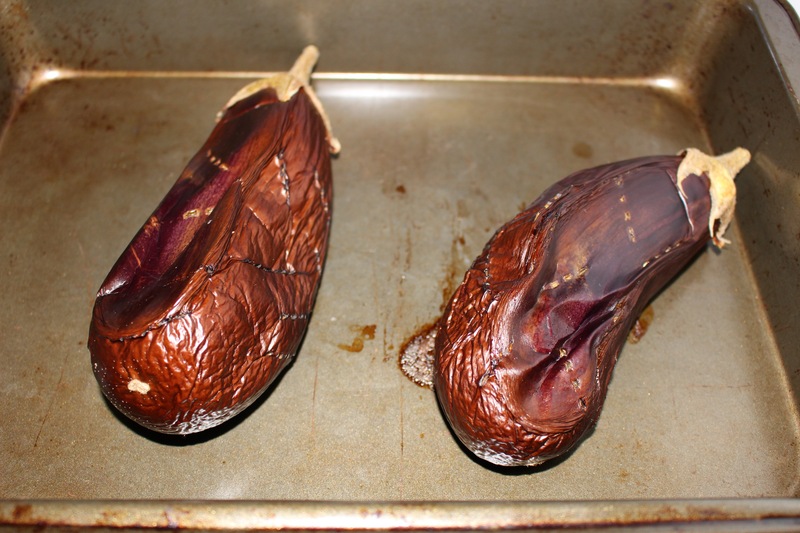 Let them cook completely then peel or scoop out the insides and mash them. 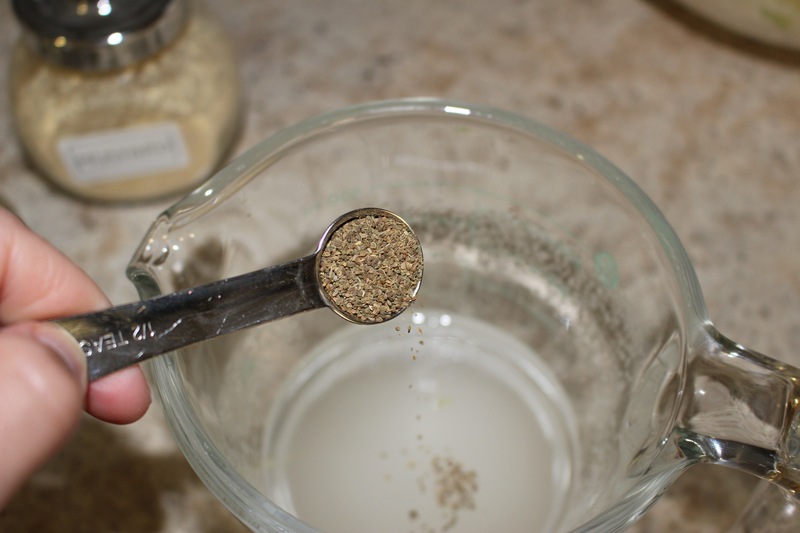 Place in a sieve and let them drain for awhile. 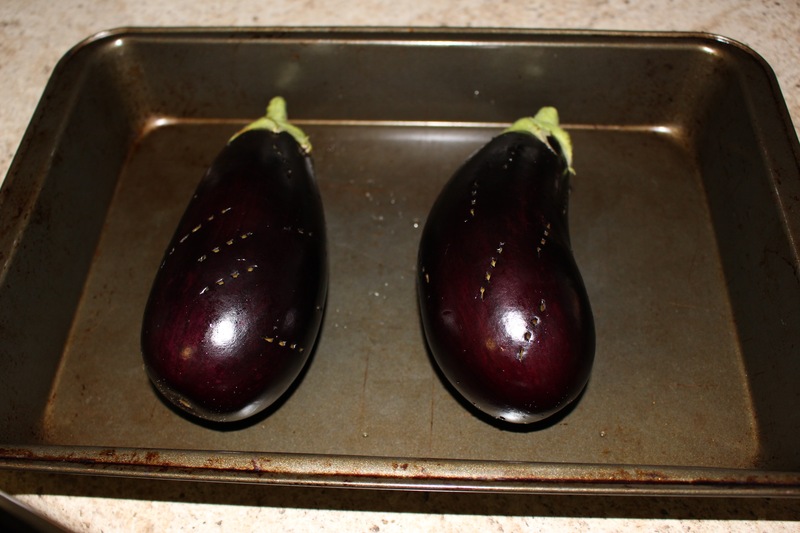 While the eggplants are cooking heat 2 tbsps olive oil in a pan and add 1 very finely chopped sweet onion and 3 large cloves of minced garlic. Cook until golden and soft. Add the drained eggplant mash to this and stir looking for about 5 minutes, take off heat and season to taste with salt and pepper. Let cool. 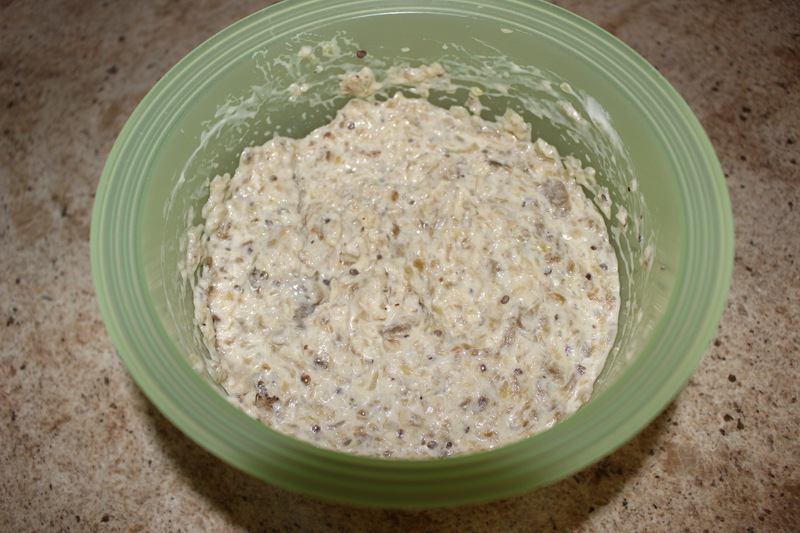 Once this is cooled, stir in 1 cup plain greek yogurt. Taste a little on a pita chip and season with some more salt if needed. Serve with pita chips. We will post the recipe for those the next time we make them, as I wasn’t thinking about the post completely since it was getting late as I was making this for a work pot luck and I needed to get finished so I could go to bed! Very nice if you finely chop a few fresh mint leaves and sprinkle over just before serving. Summer is in full swing and so is grilling. 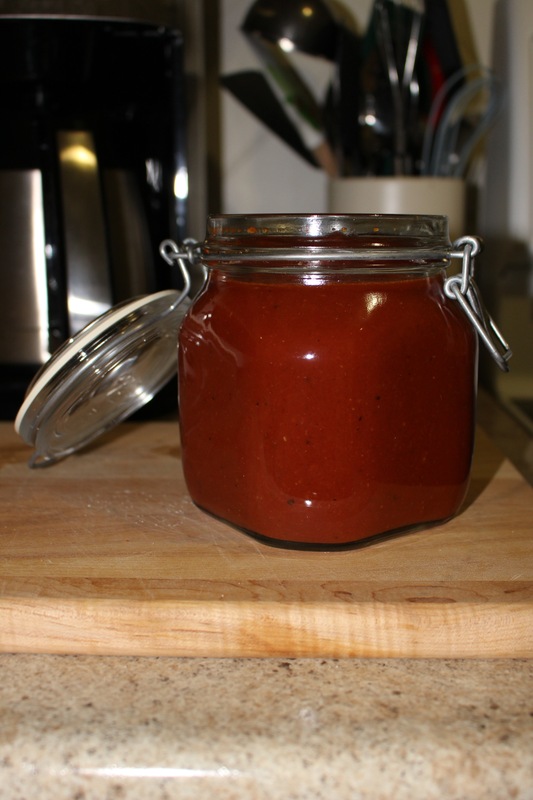 This homemade BBQ sauce is so delicious and it isn’t full of sugar, high fructose corn syrup or artificial colours or nasty preservatives it has really ingredients and is full of flavour. It keeps well refrigerated for weeks and you could freeze (in freezer bags) some as well. It does make a lot. 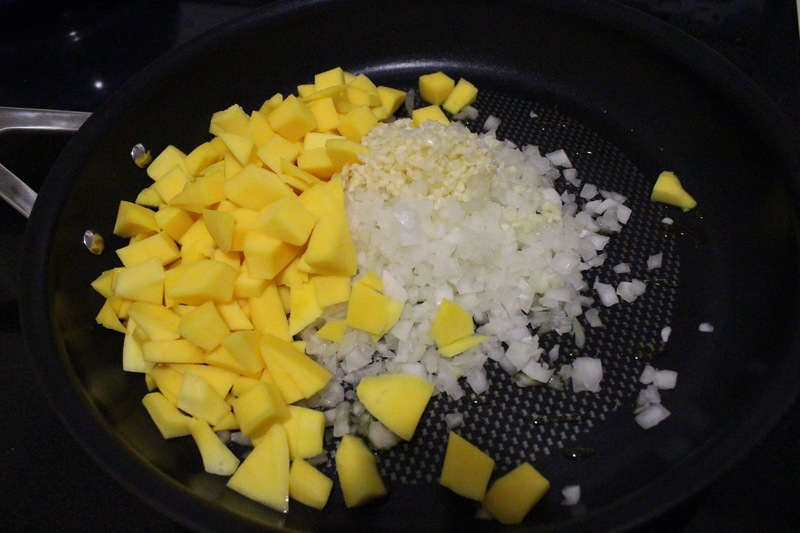 Heat 1 TBSP olive oil in pan and add 4 cloves chopped garlic and 1 sweet onion and 1 diced mango. 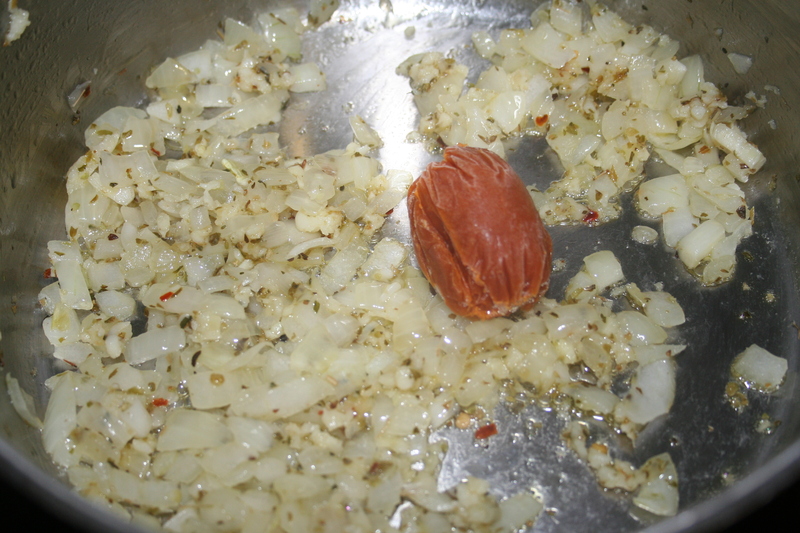 Sauce until soft and onions are translucent about 5 minutes. I love this stuff and I add it to almost everything! 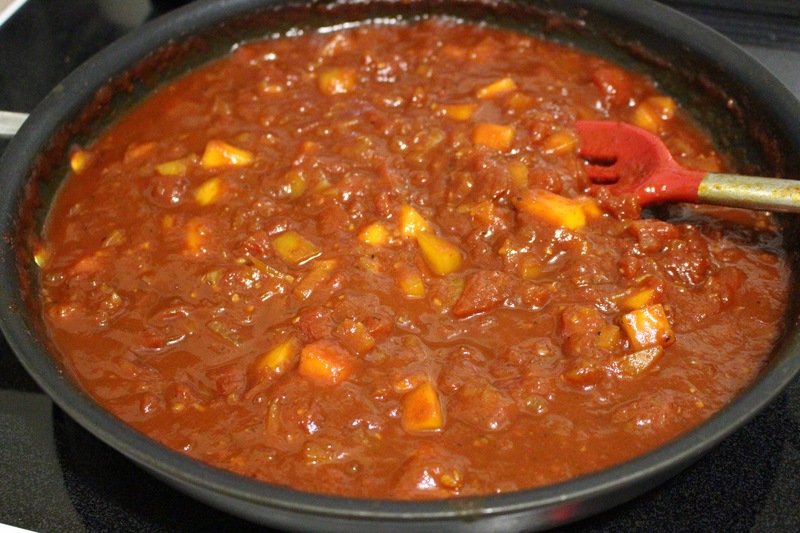 To mango mixture add 1 28oz can of diced tomatoes and 1 small can (about 5 oz) of tomato paste, 1/2 pure maple syrup, 1/2 cup molasses, 1/4 cup apple cider vinegar, 1 cup water, 2 TBSP freshly squeezed lemon juice, 2 TBSP Worcestershire sauce, 1 tsp salt and 1 tsp ground pepper. 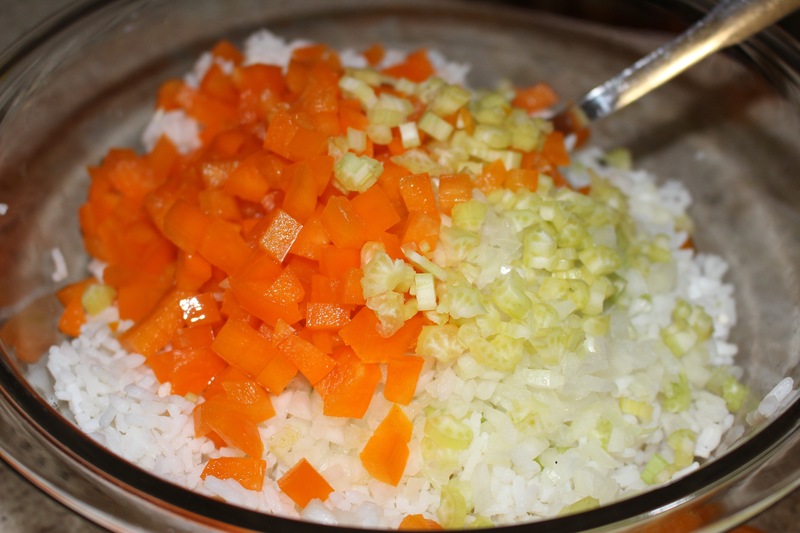 Once these are all added together mix bring to a boil and then simmer, stirring often for about 30 minutes. 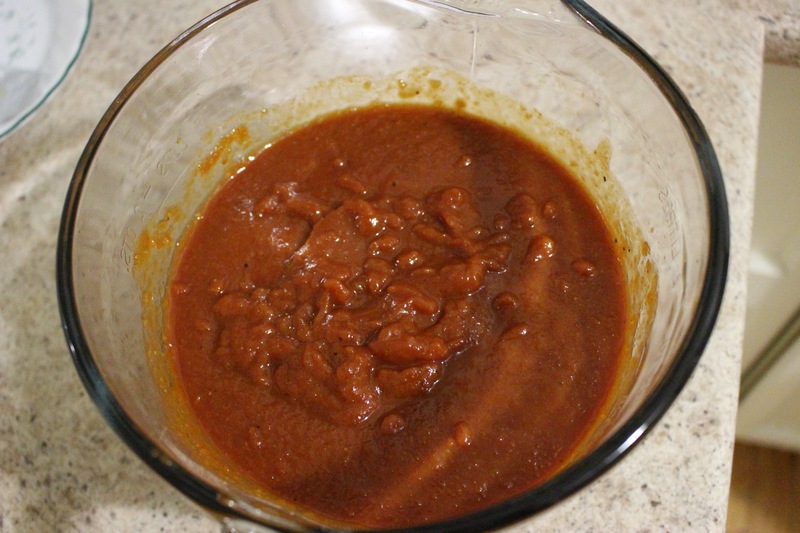 The sauce will get a little darker and thicken. 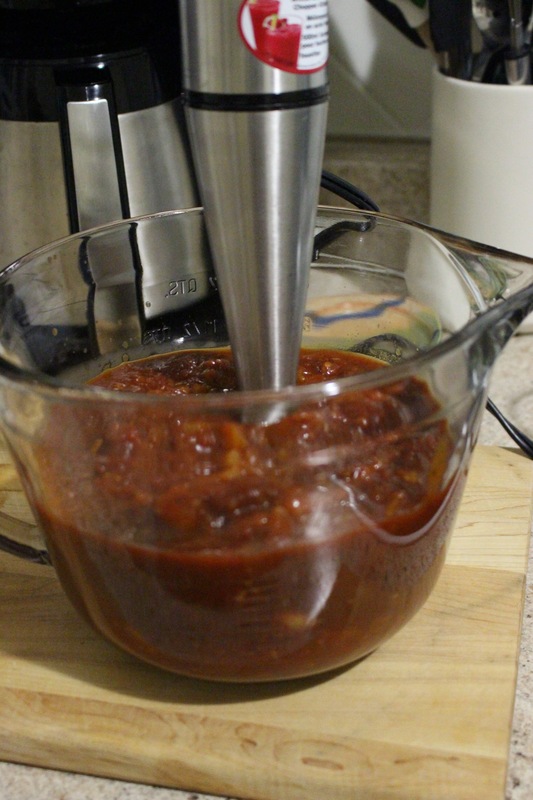 Take off heat and let cool for about another 30 minutes, then puree, I use a hand blender, and place in containers and refrigerate or freeze. This makes a lot for a small price! 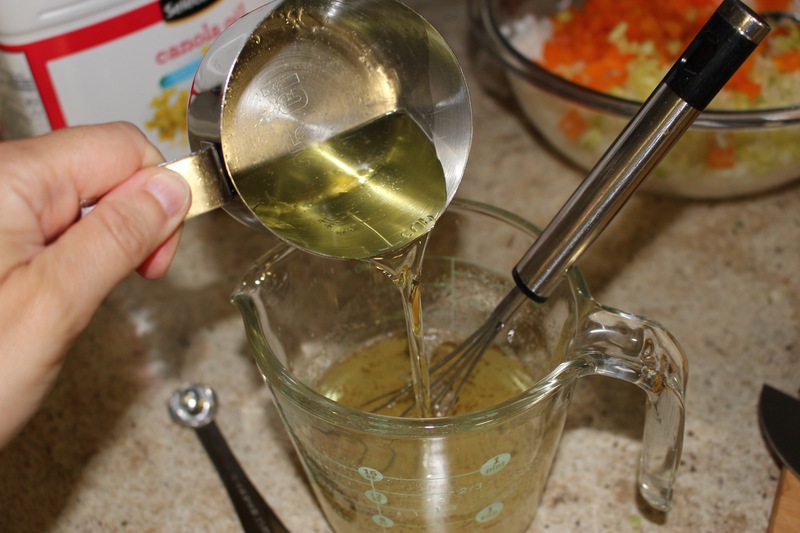 And it is much healthier than commercially prepared sauces, loaded with vitamins and minerals from the mango, molasses, maple syrup and tomatoes. If you try it let me know what you think. It has been a long time since I have posted anything new. I have tried a few times but have had computer problems and no time. Fall is slipping away at warp speed. Normally once September starts I am nesting for winter. The preserving books and recipes come out and I am hitting the farmers markets and grocery stores stocking up on the harvest and canning. This year I have done nothing, it seems so busy that I just can’t get the time or energy to do it. I do have 8lbs of apples sitting in the kitchen that has to be made into applesauce this weekend. 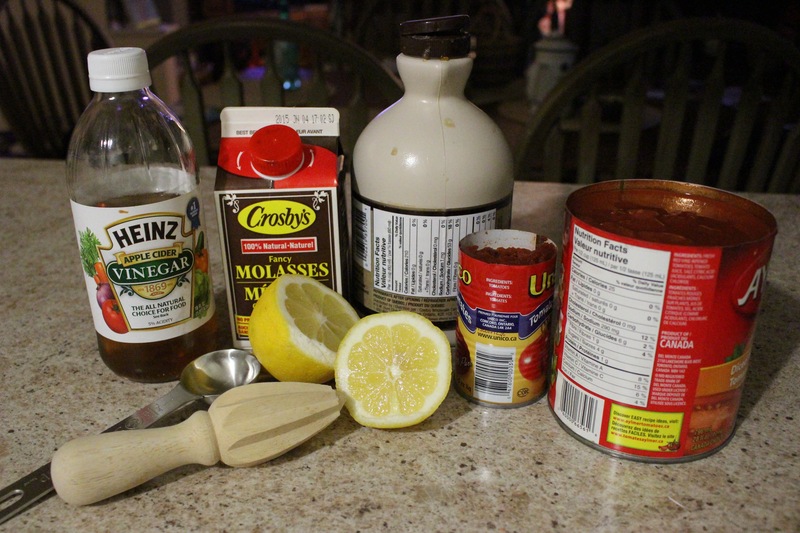 I still have to get beets, yum-yum pickles (Evie’s favorite), mustard pickles canned ( I hope). And each year I try to try something new. Last year it was plum sauce, it was good and we used some of it, but not enough to make it again this year. I am thinking a wine jelly of some sort to use at Christmas time. There are pumpkins everywhere now and I LOVE pumpkins. I need to make something pumpkin this weekend and I have a list that I want to make. This was our vegetarian (actually, I think it is vegan) meal a couple of weeks ago, I hope I can finally post it. This recipe it pretty easy and cheap to make. Like most of our vegetarian recipes it includes chickpeas, Evie’s favourite, she has even eating them right out of the can for breakfast! 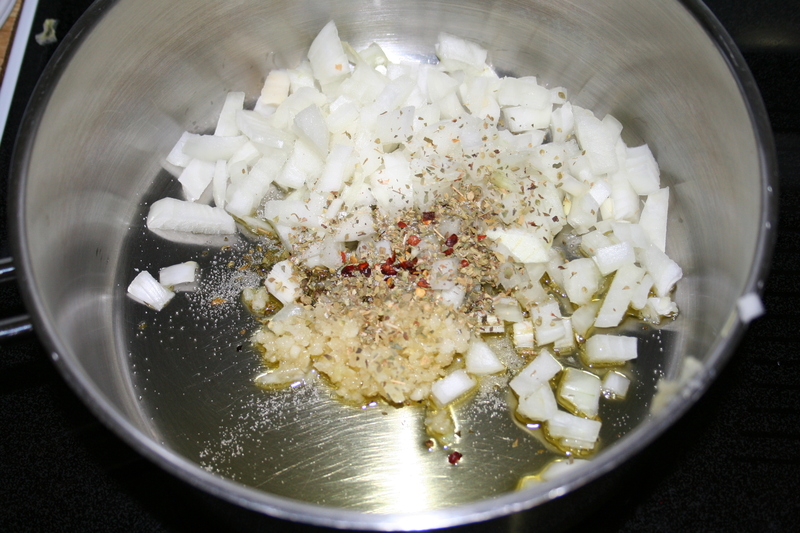 In a large saucepan heat oil and saute onion and garlic, oregano, pepper flakes and salt until onion is soft. Add tomato paste and fry for 1 minute. The paste here looks a little funny because it is frozen. When I open a can of paste I freeze the remainder in 1Tbsp portions so it doesn’t go to waste. 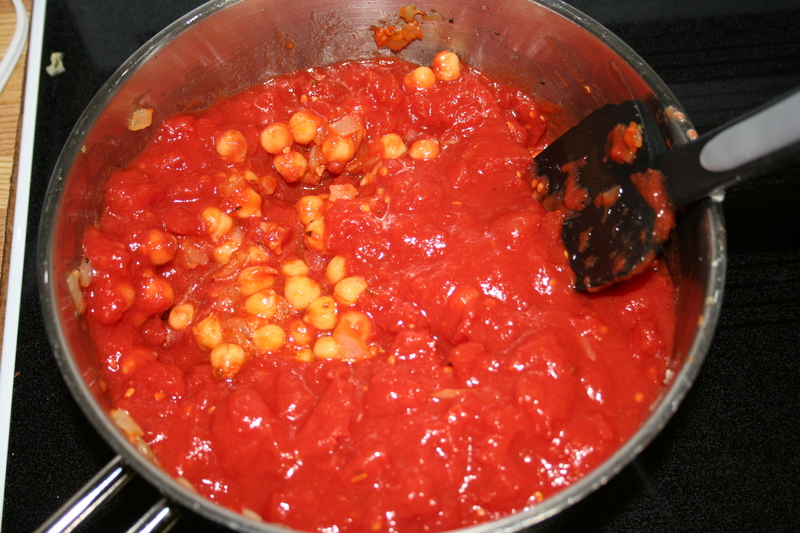 Add tomatoes, chickpeas and paprika. Bring to a boil and reduce heat to simmer until thickened, thick enough so that a spoon dragged through leaves a space, about 25 minutes. 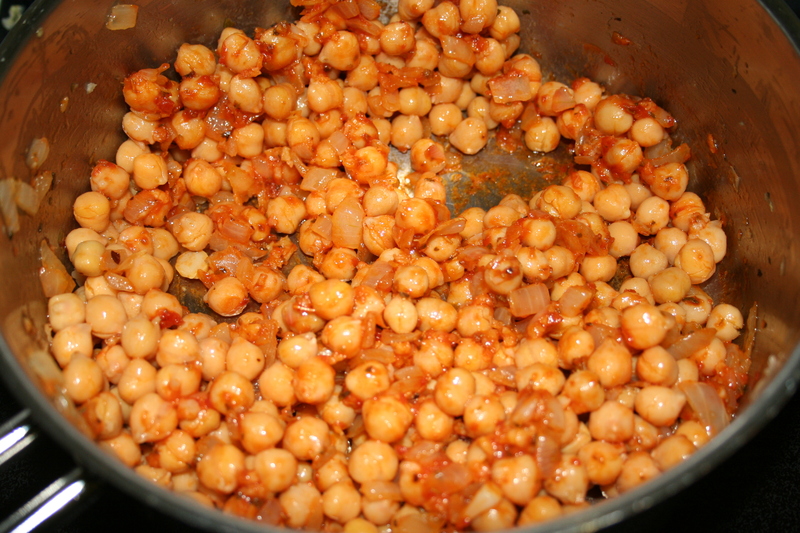 Meanwhile, if you are using spinach, saute spinach until wilted, about 3 minutes, then stir into chickpeas. Sometimes if I don’t want to get another pan dirty I just put the spinach right on top of the chickpeas and cover to let it wilt right in the pot. 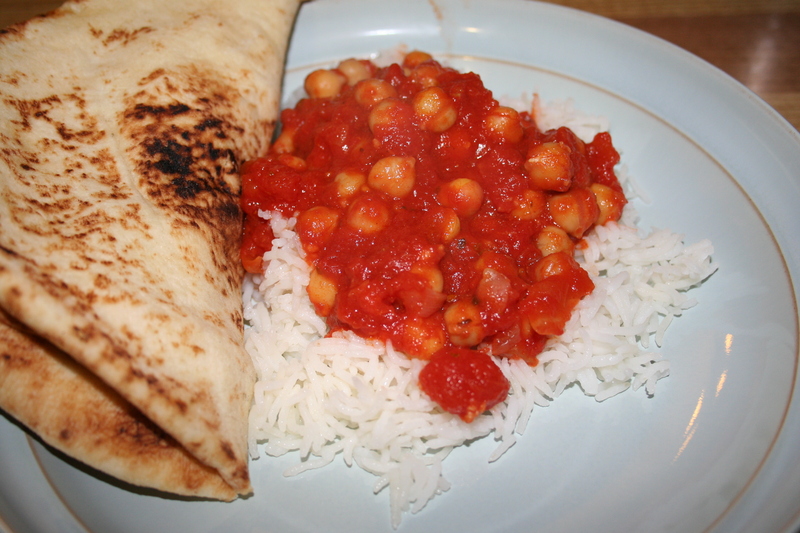 Serve over basmati rice with naan on the side.